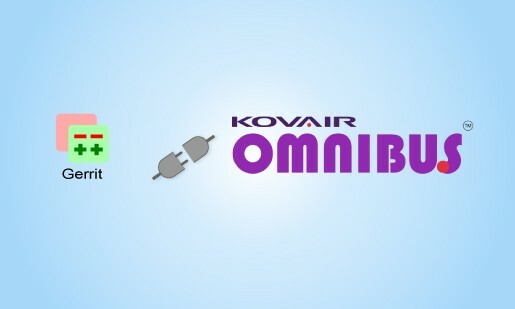 Kovair Gerrit Integration Adapter connects Gerrit to Omnibus and in turn to other ALM tools like Visual Studio, Eclipse IDE. It allows working with code reviews in an efficient manner, resulting in more time for development which is what every developer wants. It provides Continuous Integration environment where project teams can access code review information, initiate build and deployment for testing and production pipelines, after approved changes are merged with codebase in SCM repository. Gerrit is an open source web based code review system, facilitating online code reviews for projects using the Git version control system. Software developers in a team can review each other’s modifications on their source code using a Web browser and approve or reject those changes. But unless used in a connected ecosystem, Gerrit’s full potential can’t be harnessed as status of code reviews cannot be shared in real-time with other key project stakeholders e.g. QA, delivery managers and project managers. 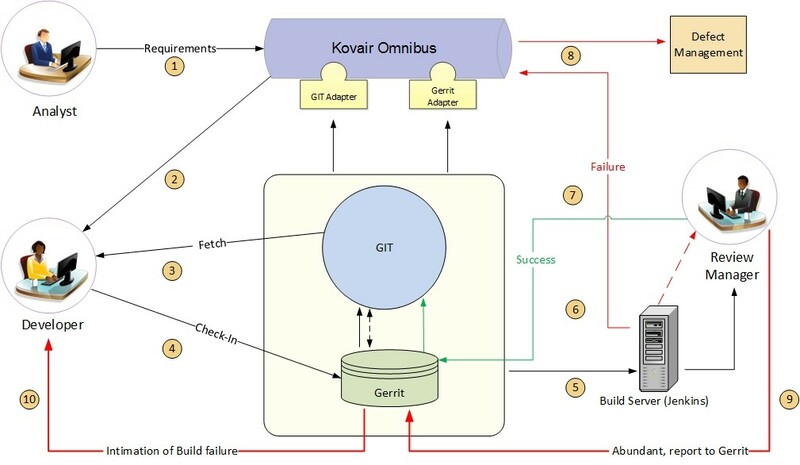 Kovair Omnibus has a complete integration with code review tool Gerrit and SCM tool Git Suite. The ‘Kovair Gerrit Integration adapter’ allows the code review information to be accessed across the integrated tool chain connected via centralized Omnibus integration platform. Finally the updated code files are sent for merging in primary branch and subsequently initiates build. The build files are then deployed for Testing and Production completing the Continuous Integration cycle. So the manager gets a complete view of the changes happening without going into the SCM system. Currently, Kovair Omnibus supports Gerrit Central 2.14. For future releases, please visit Kovair website or talk to a Kovair representative. In an integrated scenario, developers start working on client’s requirement updated by the business analyst. Developers use Git associated with Gerrit as a code repository tool. On completing development, the code is checked-in to the Gerrit system for code review and verification. Any PatchSet from Gerrit with failed status can be delegated to create a defect in Defect management tool like Jira. Once the development iterations are done automatic build and deployment can be initiated. Having Kovair DevOps in place will facilitate automated testing at staging server through Jenkins Pipeline (or any other preferred tool). If all issues are fixed in staging server, the approved code gets merged with the main codebase at the SCM repository and build is triggered. The build files are then sent to production server for QA and Release. For all failures, the list of issues identified after review are sent back to the developers for fix using the connected tools e.g. Jira for Defect Management and Jama for Requirement Management thereby identifying the traceability. Allows you to track changes in code files, view comment on lines of code made by reviewer. Kovair Omnibus adapter tracks and captures PatchSet from Gerrit, thus it provides immense power to Kovair ALM users for capturing file differences though a federated link. Allows Project Managers, Release Managers and other key project stakeholders to view the status of code review from other integrated tools and plan future course of action.